A few months ago I wrote a post about a certain genre of Holocaust Memorials that I called "Things left Behind." To the several memorials I discussed then I could have added the large Holocaust Monument in Charleston, South Carolina, completed in 1999, where the central element is a lonely discarded tallit, the Jewish prayer shawl used by men in the synagogue and also in which for some it was customary to be wrapped for burial. 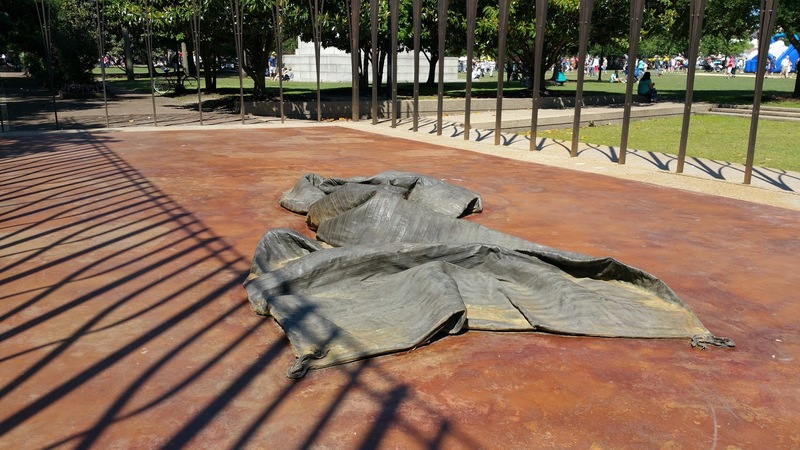 Cast in bronze, the tallit lies on the floor of a rectangular space that can been seen as a synagogue, a prison, or even perhaps a gas chamber. Left behind, the tallit indicates prayer and life cut short, but also the rites of proper burial denied. 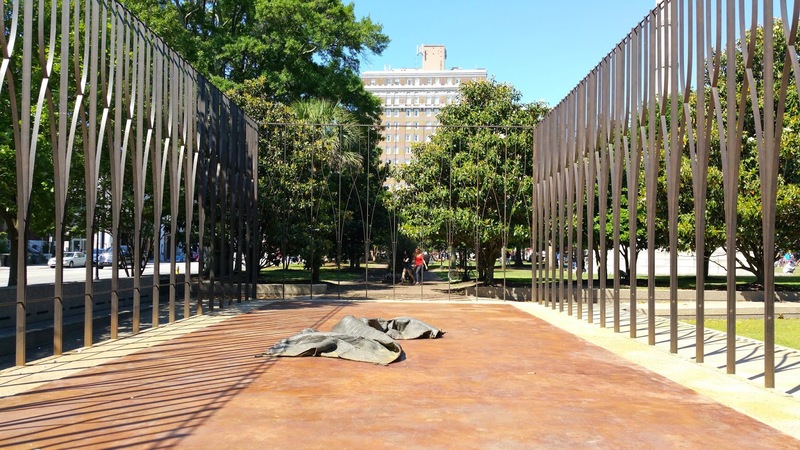 This one recognizable ritual object is set in the midst of a symbolic architecture which itself is inserted into an urban memorial field - Marion Square - rich and deceptive in the layers of history it chooses to reveal and hide. 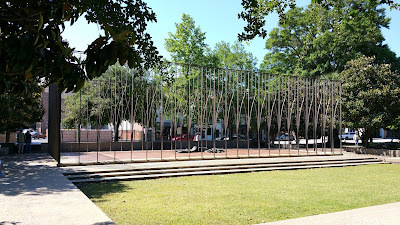 Designed by Jonathan Levi, the Holocaust Memorial was commissioned by the Charleston Jewish Federation. You can see more photos, drawings and models on the architect's website here. I've made several visits to Charleston in recent years and in traveling around the historic city I've been attentive to markers and memorials that recognize and commemorate the Jewish history of the city, including the historic Jewish cemetery and the Francis Salvador marker. I've also been attentive to those markers, such as that at a former Brown Fellowship cemetery, that acknowledge - even in a small way - that for centuries Charleston was a majority African-American city where black slaves and then black citizens outnumbered whites. It can truly be said that slaves built Charleston - their sweat and toil, blood and struggles are mixed in the very bricks and mortar of the streets, churches, houses, and public buildings. Sadly, there are still too few markers commemorating and celebrating African-American history in the city (though the number is growing). And none of these are in the three main ceremonial and commemorative spaces in the city - White Point Gardens, Washington Park, and Marion Square. 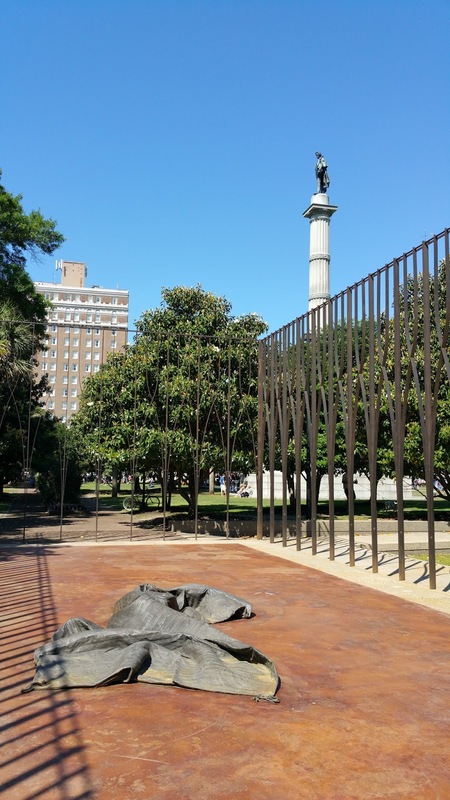 These public parks have several monuments, however, that celebrate in some way the confederacy and slavery, and none is more prominent than the enormous Calhoun Monument that dominates Marion Square. Calhoun, a great defender of slavery, stands atop a tall monument fully visible from historic black churches in the area, including Mother Emanuel Church - where the terrible shootings took place in 2015. The Calhoun monument also towers over Charleston's and South Carolina's official Holocaust Memorial Monument. 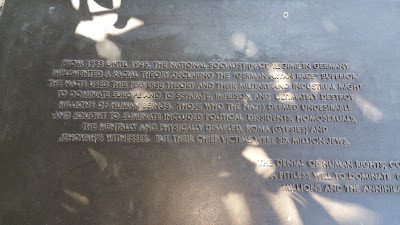 While the city's Jewish community was able to erect a memorial to the >injustices of Nazi Germany, no monument in the square explicitly mentions slavery or any of South Carolina's long history of crimes against African-Americans. 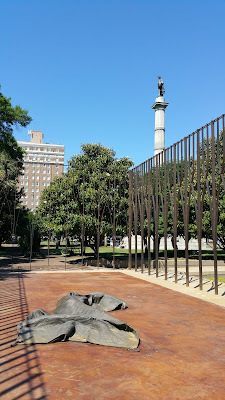 A push to erect a monument in the square to Denmark Vesey, who threatened white rule, was rejected by the two private organizations, the Washington Light Infantry and the Sumter Guards which own the square and have final approval on all monuments even though the square is maintained by taxpayer dollars. Despite intensive lobbying, both organizations refused a Vesey statue. The armory (later the Citadel)which overlooks part the square was built in response to the failed Vesey slave rebellion. Nonetheless, memorials to the South's own rebellion against the United States, in which South Carolina was a leader, are legion. In 2015 architect Levi said the memorial was originally designed in three parts; the sanctuary, a place of reflection meant to “transcend even the terrible events of the mid-twentieth century;” the place of assembly; and then the place of remembrance. These three divisions recall the purposes of a synagogue - a house of gathering, a house of prayer and and study. The north side is a rectangular, sunken lawn framed by graded steps, intended as a place of contemplation and a meeting ground for the annual Yom Ha Shoah (National Day of Holocaust Remembrance) ceremonies. 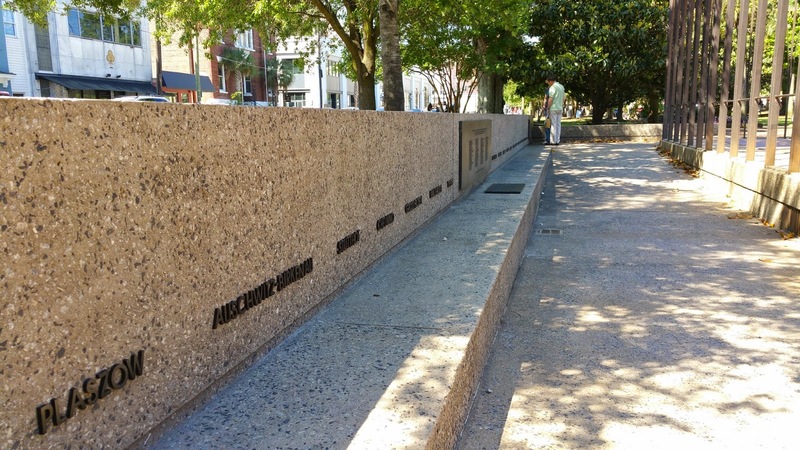 The west side faces Calhoun Street and features a concrete and bronze inscription wall detailing the Holocaust history and now also lists names of survivors living in South Carolina. 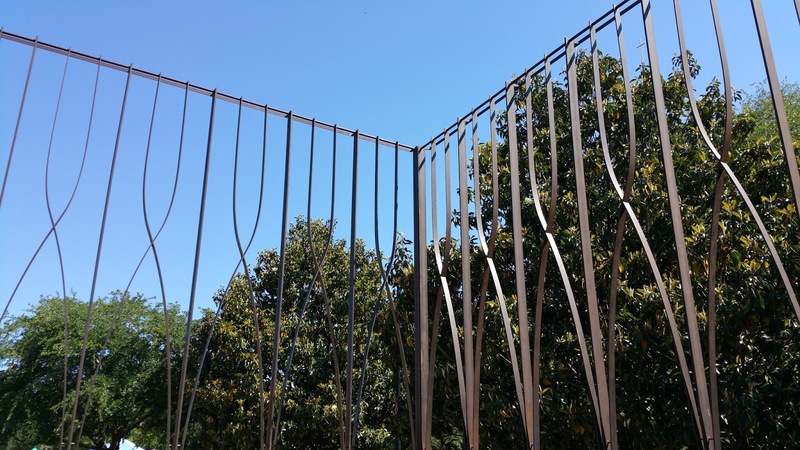 The center of the memorial, or sanctuary,is formed by a two-story high screen of mill-finish stainless steel. 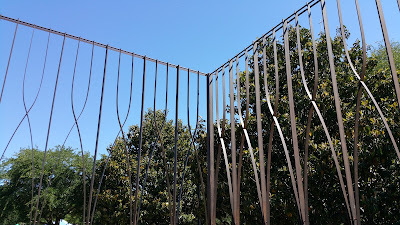 If the metal screen doesn't replicate any known synagogue, it does remind me of the metal bimah in Prague's Altneushul. Prague, Czech Republic. Altneushul. 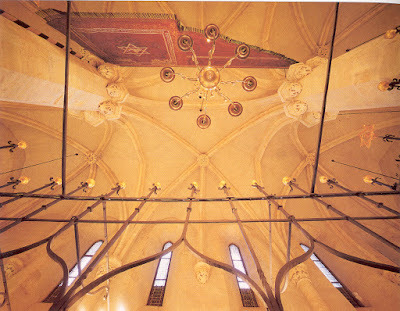 Looking up from bimah. 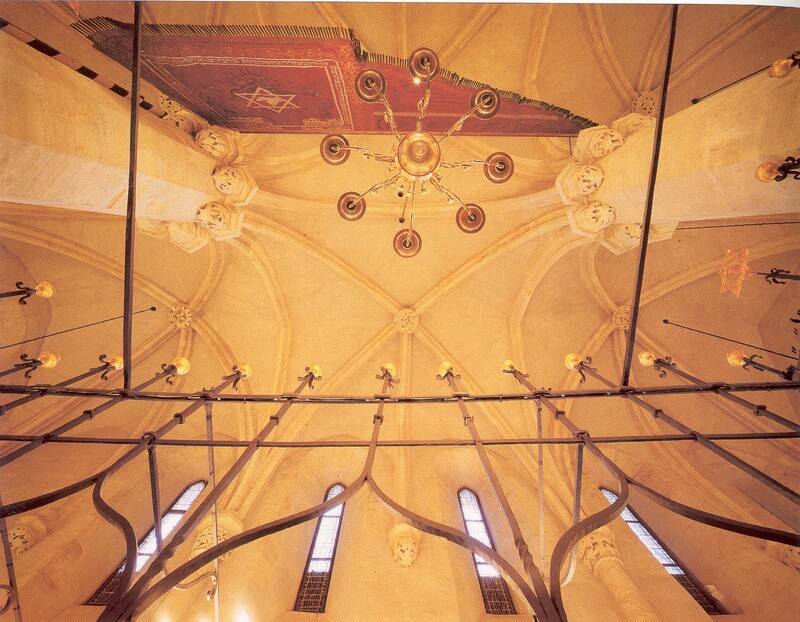 Photo from Arno Parik et al Prague Synagogues (Prague: Prague Jewish Mus., 2000). 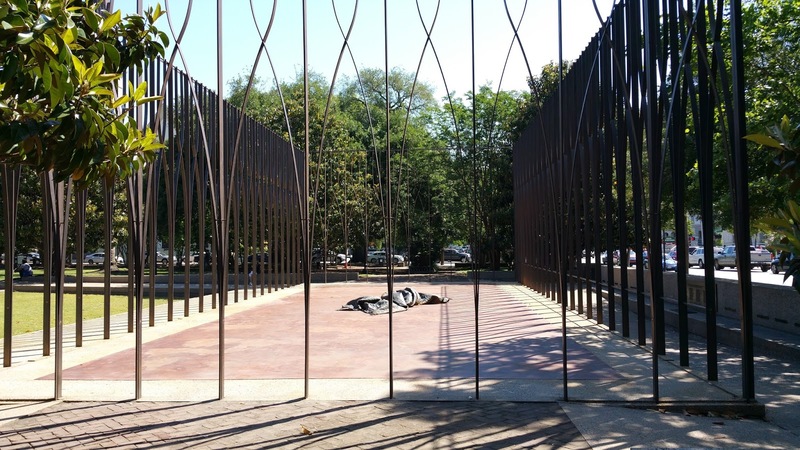 On the pavement within the four sided 25 feet wide, 60 feet long, and 17 feet high metal screen lies a 12-foot bronze tallit. This reads as a quasi-sacred space - separate from the viewer, who must decide his/her own physical, emotional, and moral distance from the crimes and the victims' suffering. The abandoned tallit calls to mind all those synagogues of Europe whose congregations were dispersed and murdered. While the original design was meant to generalize by presenting broad symbols and big ideas. In 2015, h shortly before I visited the site, it was refurbished, and specific names of 24 camps and survivors were included. From 1933 until 1945, the National Socialist (Nazi) regime in Germany implemented a racial theory declaring the “German Aryan Race” superior. The Nazis used this perverse Theory and their military and industrial might to dominate Europe and to separate, imprison and ultimately destroy millions of human beings. Those who the Nazis deemed undesirable and sought to eliminate included political dissidents, homosexuals, the mentally and physically disabled, Roma (Gypsies) and Jehovah’s witnesses. But their chief victims were six million Jews. 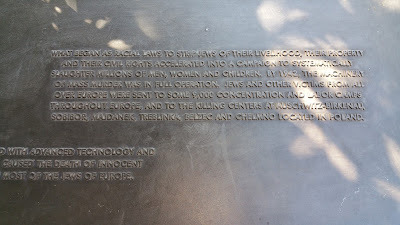 What began as racial laws to strip Jews of their livelihood, their property and their civil rights accelerated into a campaign to systematically slaughter millions of men, women and children. By 1942, the machinery of mass murder was in full operation. Jews and other victims from all over Europe were sent to some 9000 concentration and labor camps throughout Europe, and to the killing centers at Auschwitz-Birkenau, Sobibor, Majdanek, Treblinka, Belzec and Chelmno located in Poland. The denial of Human Rights with advanced technology and a pitiless will to dominate, caused the death of innocent millions and the annihilation of most of the Jews of Europe. In 2015 additional plaques were added listing the names of Shoah survivors who settled in South Carolina.